Starting in Windows 8.1, a display miniport driver must implement the DxgkDdiGetNodeMetadata function, which is used to query the engine capabilities of a GPU node. This information helps with the evaluation of how workloads are scheduled and distributed among nodes and improves the ability to debug applications. A pointer to the DxgkDdiGetNodeMetadata function is provided by the DxgkDdiGetNodeMetadata member of the DRIVER_INITIALIZATION_DATA structure. Each display adapter on the system has a number of different engines available to schedule tasks on. Each engine is assigned to only one node, but each node may contain more than one engine if that node is associated with multiple adapters—such as in linked display adapter (LDA) configuration, where multiple physical GPUs are linked to form a single, faster, virtual GPU. 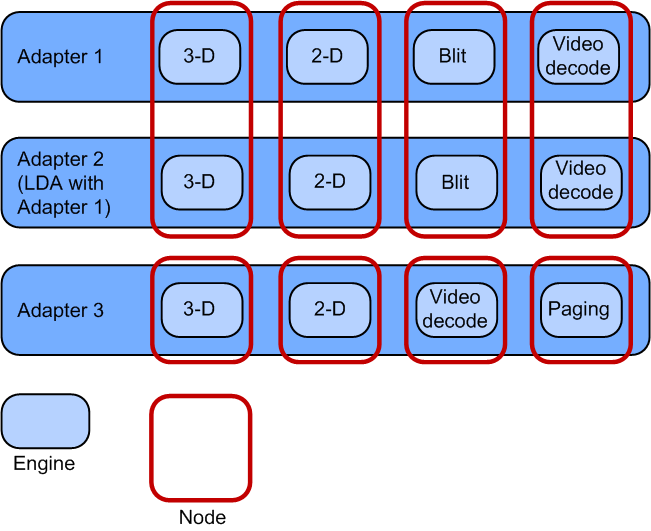 Different nodes represent the asymmetrical processing cores of the GPU, while the engines within each node represent the symmetrical processing cores across adapters. That is, a 3-D node contains only identical 3-D engines on several adapters, and never a different engine type. Because the engines are always grouped together in nodes by engine type, the engine type information can be queried based on a specified node. The types of engine that the display miniport driver can specify are listed in the DXGK_ENGINE_TYPE enumeration. This code shows how a display miniport driver can implement some of the engine types that can be returned by the DxgkDdiGetNodeMetadata function. //workloads. Therefore the 3-D capability is what must be exposed.